For most of the first millenium, the Silla Dynasty ruled much of the Korean peninsula. The capital city of the Silla Kingdom was Gyeongju. Today, Gyeongju holds some of Korea's most important temples and historical spaces. It is considered the "museum without walls" because of the historical importance of the city's landscape. I was only able to see a handful of the sights, but the ones I did see were wondrous. Here are just a few shots from this fascinating place. Anapji Pond is a must-see in Gyeongju. It is was constructed as part of the SIlla palace complex in 674 A.D. and is best viewed in the evening when the stone walls light up. The artwork on the roof of Bulguksa Temple is fantastic. Shown here is a dragon with a fish in its mouth. Korean dragons generally have antlers like deer and often include a mixture of other animal characteristics. In traditional Korean mythology, the dragon is a protector and guardian of the people. Lanterns hang at Bulguksa Temple in honor of Buddha's birthday which is celebrated every year at the end of May. A family is having fun with some glowing helicopter toys. In the background is Cheomseongdae Observatory. Built in the 7th century A.D., it is the oldest surviving observatory in Eastern Asia. The moon is hanging out above the observatory. Shoot for the moon buddy! Cheomseongdae Observatory - As I watched the moon set over this ancient structure that was built for studying the cosmos, I was overcome with a sense of enchantment and mystery. It was magical. Cheongwansan means "Crown Mountain". I look at it everyday; its rocky crags overlook the town of Daedeok and my home. The peak elevation is 723m (2,241ft). Here are a few shots of a great sunset and sunrise from the top of this precipice. The magnificent view from the top of Nine Dragon Rock. My good friend Jeanette "LeRoodles" relaxing and watching the sunset. This rock is known as "Nine Dragon Rock" because of as the legend goes, nine dragons landed on this rock and left their foot prints in the stone. You can see one of the deep footprints here just below Jeanette. The sun falls behind a smokey curtain. This time of year, the farmers of Jeollanamdo burn the excess material in their fields to prepare for the new growing season. This is a long exposure of the clouds forming. 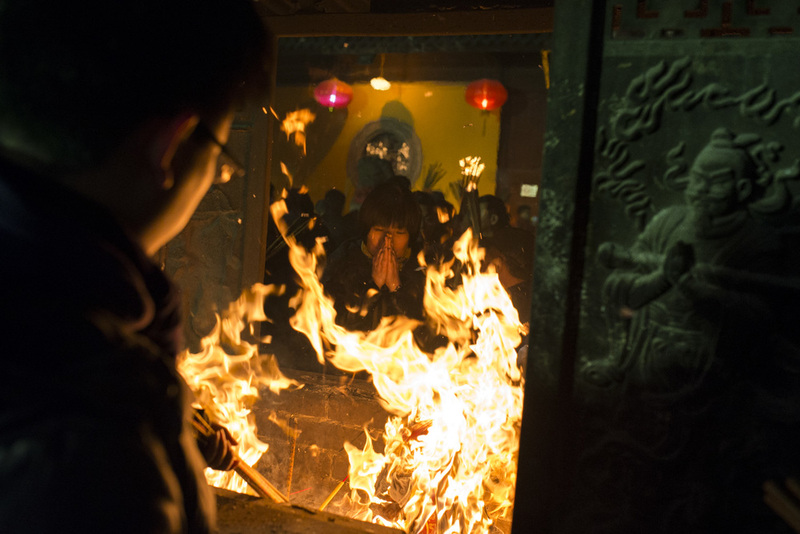 A woman is deep in prayer between the flames at Longhua Temple. The scene was surreal. Surrounding me were thousands of people, holding burning joss sticks and praying for the start of the Lunar New Year. Every minute a bell would ring. GONG. The entire crowd would bow simultaneously with the bell. It was an epic sight to see. The mood was solemn as everyone was focused on their prayers. I was overwhelmed. The masses. The fire. The striking bell. Not only was it intense just to be in the middle of it, but the photographer in me was going crazy trying capture its magnificence. In between firing off shots, I was trying not to trip over people or get burned by the fiery sticks in everyone’s hands. Wafts of smoke were overtaking my nose and lungs, and my eyes were tearing up in the stinging heat. It was powerful and truly an awesome event. Longhua Temple is the oldest and largest temple in Shanghai. Joss sticks are a type of incense that is used during prayer. Here are some shots from what is one of my most favorite photo experiences yet. When the fires became too big, a crew of firefighters was ready with hoses to keep things in check. It was a beautiful day and I just had to explore. I looked at the map and Maryang called out to me. It's a harbor town in Gangjin County not to far away from my place. So I went there. I stumbled into a fish auction, ate some octopus, and was given a ridiculously nice sunset. A lovely afternoon indeed! This guy was a friendly local. I was walking by and he just wanted to say hello and welcome me to his town. We used the translators on our phone to communicate for a few minutes. Wish I could have talked longer but the sunset was exploding into magnificence and I had to head to the harbor the catch the shot up at the top of this post. This guy was a character. We had a 45min "conversation" while I waited for a bus. We talked about Iraq, Obama, machine guns, smartphones, TV, and cars. The details and opinions of our discussion were just a little fuzzy - he only knew about 30 words of English, and I only knew about 30 words of Korean - but we certainly enjoyed sharing the time! In South Korea, couples will often wear the same shirts or outfits. These two had a shirt I couldn't resist. Charlie Brown is the man. I have a lot of fun taking photos of random people on the street, especially in a country where I don’t speak much of the language. What usually happens is I catch someone’s attention, make a gesture towards my camera, and smile. Some people smile back and give me a nod. I smile some more and snap a few shots. Some people are confused and give the “meee??? ?” look. Then I give them a little push of confidence with a larger smile and nod and maybe a “yes, yes!” or a “nay nay”, or whatever confirmative word I happen to know in their native language. I try to let them know that they look good, or stylin’, or downright fabulous. More often than not, however, people just say no. Most say no with a respectful smile and a shake of the head. But there are a few who literally freak out in disgust as if I’m asking them for fifty bucks and a back massage… I mean I understand that they don’t want their photo taken and I completely respect that. I just wish they would not be so upset about it, especially when I showed respect enough to ask (because most of the time, I’d rather just shoot their glorious natural aura without them knowing). But I guess I can’t really judge them, I have no idea what their day or week, or their life has been like. But the great, great thing about taking pictures of people in a foreign land is that the experience brings us together for a moment. The camera becomes a bridge of consciousness, a vessel for interaction. Even if the person says “no” to the photo, we still share just a touch of our lives. When I do a get rare encounter with a person who is as interested in me as I am in them, the experience can be the highlight of my day or week, or maybe my life. Interacting with someone who can’t converse with me sometimes provides a deeper connection than if we are able to speak. Maybe the lack of dialect strips away the technicalities and we find our selves talking in a simpler way. Smiles, eyes, laughs… awkward gestures. We are separate people from different worlds and we know nothing about each other’s lifestyles or beliefs. But in these moments what we share is the most simple and real connection, and we find ourselves appreciating each other just for being here. Here are just a few shots of some cool people in Gwangju, Korea. Ulsan Bawi is a spectacular spine of stone. I woke up at 3 a.m. to reach this place for the sunrise. Though the sunrise itself was slightly underwhelming, the rock and view was fantastic, and the light was beautiful. I had also woken up that morning to a bad case of what I will refer to as "bibimbap explosion", which, I will not go any further detail other than saying that it made spending a long time up on this rock really difficult with no toilets in the vicinity. My hike back down was a fast, fast pace. One of the most enchanting places I have been to, Seoraksan National Park is an impressive garden of jagged peaks and granite spines surrounded by forests and mountain streams. My experience in this place was one that I will always hold high on my list of great things I've done. Though it was not without its challenges, I mostly felt like I had died and gone to heaven. You see, I have a deep deep love of mountains and rocks, which is Seoraksan's specialty. As soon as I stepped off the No. 7 bus from Sokcho City, I knew we were meant to be together. I spent three days exploring this wondrous playground, and I would have stayed much longer had I ignored certain responsibilities. But life is long (hopefully), and I shall return someday for another dance with this magnificence. It was the Chuseok Holiday while I was in Seoraksan. Chuseok is a harvest moon celebration and is compared to Thanksgiving in America. This photo was taken on Chuseok night's full moon, which also happened to be a super moon. I was lucky to have clear skies and a beautiful landscape. Dragon Tooth Ridge - A panoramic stitch made with an 85mm lens and a D800 shot vertically. I wish I could upload the image at full resolution because the detail is awesome. There are people standing on top of a rock in the middle of the frame. I will be making a very large print of this. I was very fortunate to meet Mr. Youn the day before the hike. Mr. Youn generously gave me his time and some excellent information about this hike. If I hadn't known that the shelters on this mountain sold bottles of water, I would have been carrying a lot of unnecessary liquid weight up this rather grueling hike. With an elevation of 1708m (5,604ft) Daecheongbong is the 3rd highest peak in Korea. The hike to the peak from Seorak-Dong is 11km (7mi) and a 1500m (5,000ft) vertical rise, which is a somewhat serious undertaking. I starting hiking at 3 a.m. and I lucked out with a beautiful day. Even at the top of a long, strenuous hike, there were plenty of people enjoying the day. I was out for an evening wander in my neighborhood and was so very lucky to stumble upon this blazing sunset over the rice fields. It made me happy. Late Summer in Daedeok, Jangheung-gun, South Korea. I think eclipses are pretty dang cool. But I always feel like I want to find a different way of shooting them. Everyone has got the same picture of a moon against the black night sky, makes it hard to be creative. I try to look for a mountain or a tree or a building to include in the composition, something to give the lonely moon a friend. This year I was lucky to be in Korea, where there is always a neon red cross burning against the night sky somewhere nearby. These shots were taken right by my house in the little town of Daedeok. It was a Super Moon as well, so the moon was extra big and brave. Is the blood moon a sign of the end of times? I sure hope not! I have far too many awesome things to do in my life before that happens. My first few months in Korea was a phenomenal experience. Being immersed in a new country and culture is like jumping into a lake. It's shocking and exhilarating. Life is refreshed and the feeling is incredible.... something new for the soul. Here are some shots from my first few adventures. I was wandering around Seonunsa Temple early in the morning and three cleaning ladies were sitting outside this temple drinking coffee. They motioned for me to come join them. I happily did, as I always love hangin' with the locals. They gave me hot coffee and apple slices. We relaxed and enjoyed the morning for a while, and even though I couldn't understand a word they said, it was wonderful company. I snapped this shot as they were shining up this gorgeous building. Morning sun is warming up the river at Seonunsa Temple. Drying fish and incense in Sokcho. I was hanging out by this close-line-style drying squid in Sokcho because it was an interesting subject. This kid was curious in a different interesting subject, which had orange hair and a big camera. Fresh fish and a lovely lady at the Jangheung Saturday Market. Surrounded by bamboo in Damyang. A vine crawls up the bamboo. Puppy Love in the city of Mokpo. Hanging out in a city park in Mokpo.